Of all the cats in the world of felines, the gray tabby cat is arguably one of the best-dressed kitties around. Gray tabbies sport that striking “M” on their foreheads like crowns. Remember — tabby is not a breed of cat, it’s a reference to a most recognizable coat pattern. 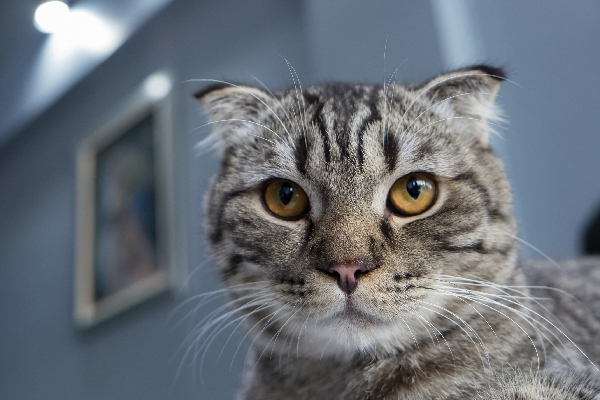 The striped tabby motif appears on almost every type of cat from the ubiquitous Domestic Shorthair to the rarer Scottish Fold. 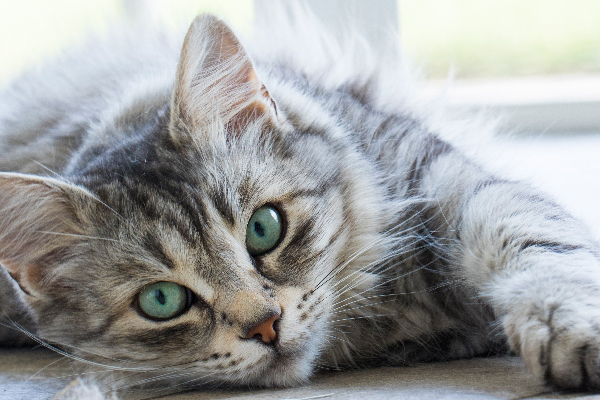 Let’s learn some fun facts about the gray tabby cat! Is he a gray — or grey — tabby cat? Photography © bebuntoon | iStock / Getty Images Plus. Is it gray tabby cat or grey tabby cat? According to Merriam-Webster, both spellings are correct for these two adjectives. Gray is the more popular spelling in the United States while grey is more prevalent in England. One mark of distinction for this fabulous feline is that Valspar has an interior paint color called Tabby Cat Gray! Gray is sometimes also referred to as blue — but let’s not split hairs. A gray tabby cat might have a variety of eye colors. And tabbies are also known to have brick red or gray pads on their paws. Genetics determine those tabby nose colors … but cat parents should know that cat noses can change color! Male cats get their coloring from their mother’s genes while female cats get a gene from each of their parents. Unlike orange tabby cats, gray tabby cats can be found in both sexes equally. Tabby is considered a dominant trait, so it’s not surprising that the stripy tabby pattern is not only featured across breeds but also many members of community cat colonies boast the striking design. The tabby stripes are also believed to be the best for camouflage. This strategic coat helped Felis catus survive on their own before becoming indispensable to the humble human. In fact, many of our house cat’s closest wild relatives hew to their tabby patterns. Lynx, the sand cat, Pallas’s cat and the Scottish wild cat are just a few whose appearance looks much like our domestic cat … but they’re best suited to hunt real prey, not catnip toys. And tabby is the coat of the “first” domesticated cats — the African wild cat, the Asiatic wild cat and the European wild cat. So, it only seems fitting that the tabby pattern is linked to the same genetics that give cheetahs their spots! Timmy the gray tabby cat. Photography by Denise LeBeau. As tabby patterns are prevalent across feline breeds, many community cats (a.k.a. feral cats) boast tabby coats. While there are some true feral felines who prefer to eschew human contact, many youngsters are friendlier to people. Or they simply come around because yummy food and a chin scratch feels pretty good. Partnerships between community cat caregivers and local shelters help save more cats’ lives. Through these partnerships, kittens get adopted into loving homes. Especially tabbies! I got to meet a sweet gray tabby cat named Timmy who represents all that’s wonderful about these partnerships and the stripy, tiny ghost tigers they rescue. 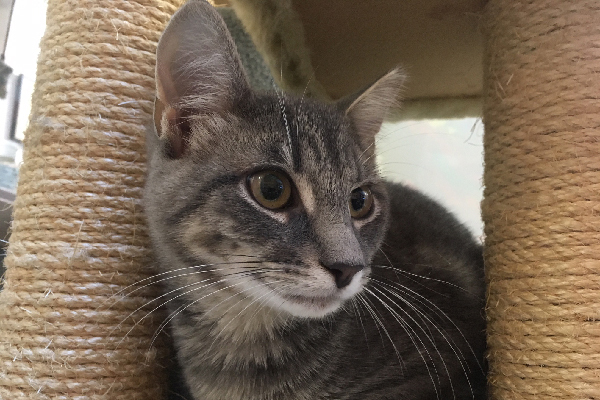 Timmy was accepted into the North Fork Animal Welfare League’s kitten program through a community cat caregiver. Its kitten room has a range of very friendly to extremely shy residents. Packing special salmon treats, I went into the room to see who could be plied with delicious goodies. Some kittens climbed right on my lap. Others would only accept a treat if it was tossed a safe distance away. But then there was Timmy, a gray tabby cat. On his own, Timothy came up to my hand and sniffed cautiously. Within 30 seconds he was cheek rubbing my fingers with gusto. Then the unabashed kitty was head butting me like we were old friends. The Timster didn’t take any treats but continued to display affectionate behavior toward me, this invading stranger! Of the dozen or so kittens, Timmy was by far the friendliest and the only feline solely interested in human contact, and uninterested in soliciting fishy rewards. He’s not the first gray tabby cat that I’ve had the pleasure of playing with — I’d say they are among the most warm and loving cats around. Whether they’re from purebred origins or plucked off the streets, on the hunt for food or on the hunt for new friends, gray tabby cats have personalities that are as distinctive as their coats. They’re beautiful creatures on the outside and unique souls on the inside. It’s hard not to fall for a gray tabby cat. Adopting one, or two, gray tabbies is a surefire way to ensure there is a lot of love in your future. Tell us: Do you have a gray tabby cat? What is he or she like? Thumbnail: Photography © MassimoCattaneo | iStock / Getty Images Plus. my gray tabby is a great and really pretty cat she loves almost everyone in the world! She is really old she is now 14 years old. even though she can be hard to take care of i love her. He loves to be cuddly on his terms. If I try to love on him he usually isn’t for it but he loves cuddling up on my lap or by me in bed. Loves being pet and always purring! We rescued a gray tabby kitten who was caked in mud and really really small. It was determined she was 5 weeks old and had barely opened her eyes. We cleaned her up fed her formula and food and she has grown i to a loving and faithful friend to our family. We love her so much. My gray tabby is the sweetest kitty. Her name is Kiki and she’s about 7 years old. She hates to be held but loves to be petted lol She a total purring machine and in the two years I’ve owned her, she has never once growled or hissed! She’s been a good companion kitty to me. I love her…and it’s evident that the kitty loves me in return. My Brother bought home a gray tabbie as a kitten and it instantly took to my 8 year old daughter and she is 9 now ky can call bumper and she will come to her immediately and ky will give her commands to lay down, give mommy kisses bumper listen’s bumper will sleep on ky at night and protect her I tried to cover my daughter I have to give bumper a snack on the floor to cover my daughter and Pat the covers and tell bumper up she is a amazing cat. My grey tabby is a monster. He does not like to be petted and will bite if you are near him. He will attack any visitors that come into our house. If you rescued him/her they might have been in an unforgettable encounter with humans, and/or might have an imbalance of hormones causing him/her to act out. maybe observe and acct on that. maybe you’ll find a way to be able to love on them and they wont be aggressive towards guests. I have a grey tabby Mia and she is so wonderful. She is very playful and always by our side. I am surprised at how well she listens and is very well behaved. She is more than I ever expected. So grateful to have her. My gray tabby Princess certainly doesn’t have any of the personality traits as mentioned in the article she is complete opposite of it to be honest with her humans and cat family alike. My first grey tabby adopted me when we were doing pet therapy together. He followed me everywhere but it was two and a half years before he sat on my lap. He was my best friend for 15 years. My second grey tabby was a Siamese cross and very vocal and bossy. Our current boy is extremely frightened of everything that moves. He hides all day then comes out late at night for head rubs and treats. We’ve had him for 6 weeks and he’s only been coming out for 10 days. What is it about grey tabbies? They are just so beautiful! My grey tabby Sammie is a rescue and he is the sweetest, most loving cat I’ve ever had. He’s a big snuggler and lap cat and very smart. He’s wonderful. I agree . I was lucky to end up with one of those loving gray tabbies. He loves to be held and be on my lap. He is also a snugglet. He is friendly to others but I am his number one. He is a love-bug! We have 2 gray tabbies, brothers, who we believe may have been born under our deck, or in our neighbors’ yard. Our neighbors, who had 3 cats, were able to capture 3 of the 5 kittens and so we took 2. Ziggy was our late dog’s best buddy, and now is my lap guy, and Marbles favors my husband’s lap. They are both indoor cats only since we took them in, and are @ 12 now, still giving us attention and socialization. My gray Tabby boy cat Loki is the definition of a “scaredy cat.” He is a rescue from a family who dropped him off at the shelter saying, “doesn’t get along with kids.” In my mind, that translates to these 3, 5, and 10 year old kids tortured him. I’ve had him a year and a half now and he is just starting to get over his skittishness. I had no idea a cat’s nose could change colors. I have 3 best tabbies, 2 females and 1 male. Only one is really immediately friendly. The other two take time to warm up but are very loving after they get used to you. AS to your article on allergies, if you are allergic to your cat, bath it every few weeks until your allergy stops. I only had to bath mine once or twice. Is the gray tabby a lynx point cat? Cross between siamese and tabby correct?